We are a boutique firm in Northern New England with a mission to create beautiful buildings with excellent energy performance and wonderfully livable environments for people. We are optimists and problem solvers, inventors, and sculptors who use the ideals of art and the pragmatics of building science together to make heirloom architecture. We crave challenges, and love to meet new people. If you are looking to create something wonderful, we would love to hear from you! Our mission is to bring beautiful, sustainable, attainable buildings to the world. We are an award-winning design studio and a leader in sustainable design in the Northeast. It’s visible in every project we work on, large or small. We believe in a team process where each client can have their specific needs met, their individual aesthetic embraced and their budgets respected. We call it “The Not So Big Ego.” Come check us out! We are a passionate firm focused on rethinking the way architecturally-designed projects are created and delivered in our region. We design, we build, and we partner with our clients to fulfill their vision. We are an award winning architecture and construction firm offering custom design/build services for new homes, renovations, additions, and commercial projects, with noted expertise in completing projects on challenging waterfront properties. Our services include pre-design and pre-construction services, such as real estate development consulting, feasibility reports/comparisons, regulatory research, construction estimating, and cost engineering, as well as full architectural services and complete construction services, from permit to closeout. We love what we do, and it shows in our work. For more information, visit calebjohnsonstudio.com, or contact the firm at (207) 283-8777 or via email: caleb@calebjohnsonarchitects.com. KBA’s design approach is to create timeless architecture that is inspired by the classic New England architecture of the past, whether it may be new construction or renovation. We create a new vernacular style that will integrate many modern day amenities and efficiencies. Not recreating history but paying homage to the classic New England architecture. Give us a call today, we would love to hear from you! Since 1986, Whitten Architects has been designing thoughtfully considered homes in New England. With a focus exclusively on residential design, we are experts in a variety of project types—from camps to cottages, new homes to historic renovations. Our work has won a number of awards over the years and has been extensively published in a variety of residential home design books and magazines. Our like-minded team of five architects and three designers collectively offer decades of hands-on residential design and construction experience, as well as a common ethos: we believe a home should reflect its occupants, and its design should develop from an appreciation for and an understanding of its site. Using an efficient combination of hand-drawing and our office’s state-of-the-art software, we help our clients envision their home even before construction begins. Note: We're finding that current home construction costs run $350-500 per square foot to achieve the results you see in our portfolio. This range is for the finished building only and is exclusive of design fees, site development, landscaping, furnishings, and soft costs (fees and permits). For more than two decades DeStefano Architects ( DestefanoArchitects.com ) has provided unparalleled design services to discerning homeowners throughout New England. At D|A we create balance and place by designing homes that are integral with their surroundings and that use meticulously detailed and well-crafted materials. We are dedicated to creating a warm, inviting environment for your home and incorporating the latest in sustainable design solutions. At the core of any project is your vision; it is our commitment to you to give that vision focus and definition. Whether it be an addition, renovation or new construction, we bring a wealth of experience and enthusiasm to the design of your home! Fiorentino Group Architects is a professional firm dedicated to the design of quality environments. Our goal is to bring your ideas to life in creating a home which embodies what is truly special about you. Emphasis on attention to detail and good communication is what sets us apart. This approach is used to launch, develop and complete the design process. Our firm’s designs incorporate state of the art technology to offer various services. Some examples are virtual computer animation to a personal project web folder, allowing Clients to access and edit their project information at any time. We offer programming, working drawings, and construction administration services. We are proud of creating strong relationships between the Client and the Project Team, which includes the General Contractor, Interior Designer, Landscape Architect and Engineers. The Fiorentino Group welcomes the opportunity to demonstrate what differentiates us from other architects. Based in Portland, Whipple I Callender has been serving people throughout Maine and beyond for 40 years. Our team is comprised of three licensed Architects, three architectural designers, an office manager, and springer spaniel named Dash. We specialize in residential design and renovations; commercial, academic, and healthcare design; and office planning. Projects vary in size from a 56-bed prep school dormitory to one-of-a-kind light fixtures. They vary in style from updated shingle style to minimalist contemporary. All buildings affect us in some way. We want ours to capture your interest, to make you feel responsible about the way they are built, and, most of all, to be happy to inhabit them. Buildings should be practical as well as beautiful. We work to make them greener, smarter, economical, and friendly. Briburn is committed to creating innovative, energy efficient, green solutions for residential, commercial, Institutional and civic projects that artfully reflect our client’s needs and interests. Until recently, BRIBURN was the Green Design Studio of Yarmouth Maine. Near the end of 2012 Christopher Briley and Harry Hepburn partnered to form a new company with increased architectural abilities and experience in a wider range of project types. 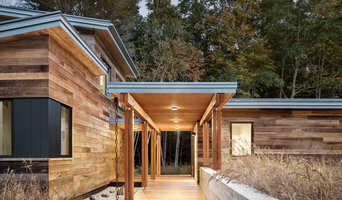 For seven years, the Green Design Studio specialized in energy efficient, environmentally friendly design, and completed several high performance projects (including the first LEED Gold certified home in New England). Now, as BRIBURN, the commitment to sustainable design is even greater. We understand the many tasks required to create a successful project, we are thoughtful, innovative thinkers, often developing unique ideas specific to your projects needs. Currently BRIBURN is completing a passivhaus / net zero home in Saco, a sustainable Veterinary Clinic in Cumberland, a Net Zero home in Parsonsfield, as well as several other sustainable residential projects. Design Philosophy: “architecture for life” is the creation of architecture that is timeless, environmentally friendly, beautiful, and long-lasting. Architecture that focuses on the experiences of the building’s occupants, enhancing their daily lives with natural daylight, excellent ventilation, and delightful spaces that engage their artful minds, architecture that is mindful of our finite resources and respectful of the natural environment. It is architecture that will stand the test of time by being very durable, simple to operate, economical to maintain, and beautiful. Robert (Bob) A. Lenahan Architect AIA, is an Architecture and Design firm based in the Historic seaport city of Portsmouth, New Hampshire. I am a native of the seaside community of Montauk, NY. I graduated with a Bachelor of Architecture degree from The New York Institute of Technology in 1984. I am licensed in the states of New York, New Hampshire and Maine. I am registered with the National Council of Architectural Registration Boards (NCARB), and the American Institute of Architects (AIA). I am well versed and studied in the shingle style vernacular & seaside architecture. My strengths and passions are related to custom residential architecture. My design philosophy draws upon classic and indigenous styles, blending modern ideas and technology with classic and timeless Shingle Style Architecture.I uphold and strive for the highest standard in quality,style and design for custom homes and renovations in Long Island, New York's "The Hamptons", New Hampshire and Maine. I believe that the key to the finest projects is a close collaboration between the client and their Architect.Each house is exhaustively detailed and designed with the lifestyle and wishes of the client in mind before its creation. The main goal has always been to combine today's modern living within a traditional design. Founded by Linda Banks, ASID, Banks Design Associates provides residential clients with the unique combination of architecture and interior design services nationwide. Simply Home is our retail store and design center, and home base for both companies. From the design of a whole house to a major renovation, or strictly the interior design of an existing home, Banks Design Associates believes that each family or individual client has a unique list of ideas and visions to contribute to the design of their project. As a result, no two projects look the same. Each solution is developed and tailored to the client's dreams. Creative design development, technical analysis and complete project follow-through make those dreams a reality. Banks Design Associates has been honored with numerous awards for design excellence—we are often quoted and frequently published in national design magazines. Linda Banks has been implementing her classic design style with great success since founding Banks Design Associates. BDA's architecture, decorating, and kitchen designs have been widely published, including features in Traditional Home, House Beautiful, Classic American Home, Renovation Style, and Maine Home+Design. Linda's famous, tried-and-true design ideas and home furnishings are available through Simply Home, our 8,000 square foot, recently renovated design center and retail store. It is Maine's finest source for architecture, interior design services, and home furnishings. Carol began Residential Design Studio as a sole proprietor in 2010. It quickly became evident that RDS was going to be larger than one person! Given the economic climate of 2010, many of her wonderfully talented colleagues were also “on their own” and of a similar mindset that working together was the key to both financial and personal success. RDS quickly gained a reputation for pulling teams of highly qualified professionals together for a wide variety of commercial and residential projects. By 2011, it was clear that this model of working together was going to be successful and RDS needed to grow to support it—and her first employee was hired. . .then the second. . . then the third. . . Today, Carol remains sole owner of the Studio and is supported by a wonderfully talented staff. RDS still partners with their colleagues who are “on their own” and with large firms, so that we can meet any challenge set forth, with the best possible professional fit for our clients. Carol is the lead designer of the Studio and remains involved with her clients throughout the entire design and construction process—even when another member of RDS manages the project, Carol’s is the face you will see at every design meeting. 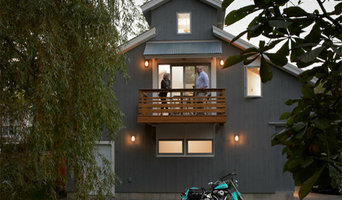 Kevin Moquin Architect is a small, friendly, professional practice based in Portland, Maine. We readily undertake projects throughout Maine, Massachusetts, New Hampshire, and will consider work beyond. We are passionate about designing the experience of a place and creating lasting architecture tailored to your needs. We believe all projects are unique and should be treated with care and consideration. Our design solutions are inspired by the uniqueness of your property, your lifestyle, your values, and your budget. 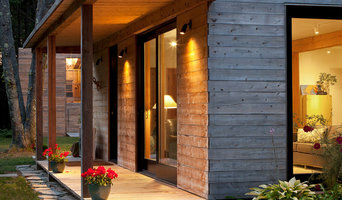 John Cole Architect specializes in the design of vacation and retirement homes, primarily in Maine. These homes all start with the owners' attachment to a place and the dream of a more relaxed life-style. My goal is to give form to the dream. My first home building experience came at the side of my father, a frugal Yankee carpenter. My training in design came later at Yale, Washington University and the School of Wood Sculpture in Quebec. In between was a brief hockey career in Europe. Early in my architectural career I designed homes for custom builders. As a partner in a large Boston area firm I continued to design homes for friends and word-of-mouth clients, as well as leading teams on award-winning commercial projects. Drawn back to my roots by the satisfaction of hands-on work, my focus now is home design inspired by New England traditions of craft, thrift and whimsy. How do I find the best Westbrook architect for my home design project? It is best to hire a home architect who will be involved in all phases of the design process, from the initial concept to the completed construction. The architect is often the first person you will hire for your project. If necessary, they might also help you select and hire Maine subcontractors, which can include the builders, engineers and landscaper. Interior architects are also involved in negotiating contracts for all involved participants. It is for these reasons that it is extremely important for you to have a good relationship with the Westbrook residential architect you hire. He or she can be the tie-breaking vote between you and the general contractor and can be your biggest advocate during the construction process. Different architecture firms in Westbrook, ME provide different services, so the scope of the work can span from pre-design environmental impact studies to selecting furniture and finishes, depending on what your specific needs are. It is very important to hire the right professional for the job. Remember that the most well-known or established designer might not provide the best architectural services for your needs. It all comes down to the individual project. Research and ask people whose work you like for recommendations. It's important to have somewhat of an idea of the style of house architecture that you prefer, as well as the amount you would like to spend. Residential architects in Westbrook, ME are natural problem solvers. They will assess the entire situation and help you to solve your problems too. Don't settle for a single company too early. Call and interview a few. Make sure that you feel like your personalities will mesh well and that you like their professional perspective. Find a home architect in Westbrook, ME on Houzz. Narrow your search in the Professionals section of the website to Westbrook architects. You may also look through photos of Maine projects to find interior architects and building designers who have worked on a project similar to yours.